Photo 1. Waterhemp in soybeans. 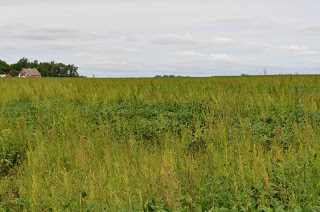 Tall waterhemp (Amaranthus tuberculatus) is expanding its reach across Minnesota, and herbicide-resistant populations are becoming more commonplace. Most waterhemp populations have been resistant to ALS (Group-2) herbicides, such as Pursuit, for a while. In addition, glyphosate-resistant (Group-9) populations were first reported in 2007, and PPO-resistant (Group-14) populations were confirmed in southern Minnesota the past two growing seasons. Herbicides in Group-14 include Cobra, Flexstar and Spartan. To add to management challenges, some waterhemp populations have developed resistance to two or all three herbicide groups. In this situation, what herbicide control options are left?